Depressed Over five thousand years ago, Moses said to the children of Israel , “Pick up your shovels, mount your asses and camels, and I will lead you to the Promised Land.” Nearly 75 years ago, (when Welfare was introduced) Roosevelt said, “Lay down your shovels, sit on your asses, and light up a Camel, this is the Promised Land.” Today, Congress has stolen your shovel, taxed your asses, raised the price of Camels and mortgaged the Promised Land! I was so depressed last night thinking about Health Care Plans, the economy, the wars, lost jobs, savings, Social Security, retirement funds, etc …. I called a Suicide Hotline. I had to press 1 for English. I was connected to a call center in Pakistan . I told them I was suicidal. They got excited and asked if I could drive a truck…… Folks, we’re screwed. Thanks Ray, I had a good laugh. The pundits relish and bask in the sun of Governor Romney’s debate performance. Oh how he destroyed Obama. Those who know Obama know they must listen to what he says and then watch what he does. Obama skillfully lost this debate on purpose. I knew it when I watched his demeanor during the debate. He looked like Mikey who just got caught with his hands in the cookie jar. At first I too relished in a victory. Victories don’t come often, and when they do I celebrate them. The problem with this victory is that it was premeditated by Obama. The Mikey look was a part of the act to make it seem like he was getting shellacked. Why would he throw the debate? He is a student of Rules for Radicals. The rules led him to throw the opposition off with a simple unexpected ploy. The Mikey look was one caused by wanting to come back to argue eloquently as he usually does, but he had to bite his tongue instead. What advantage does this give Obama? He knew his base was beginning to abandon him, and he had to become the underdog. People love underdogs. His base will love him as an underdog. 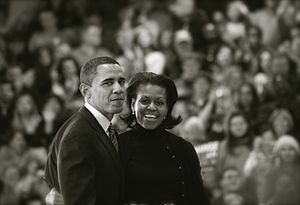 Obama will recover quickly because of the underdog principle. As a young father I often lectured my kids on how we must always take care of old people. Most of the time it was during the drive to see grandparents or Aunts. “If we don’t do it, no one else will,” I told them. They are the people who were young and alive once just like we are today. Just because they have become wrinkled, sick, and can’t get around as much anymore does not mean we give up on them. I tried my best to live by that example all my life. First it was my wife’s mother, then my own parents, then my wife, then her aunt, and now it is someone new. There is always an older person who needs love and attention. If we don’t give it to them, who will? Certainly not Uncle, yet there are laws on the books for taking care of people. One of them has established a department called Public Guardianship. A Public Guardian is a person who works for the agency. He/she gets the job of taking care of a person’s life. First, the agency must convince the judge that this person can not take care of themselves. Once the judge rules on the matter the guardian takes over, and assesses the person’s estate. The court orders the guardian to establish a trust for the person’s belongings. The person must leave his home and live under the care of a new home. 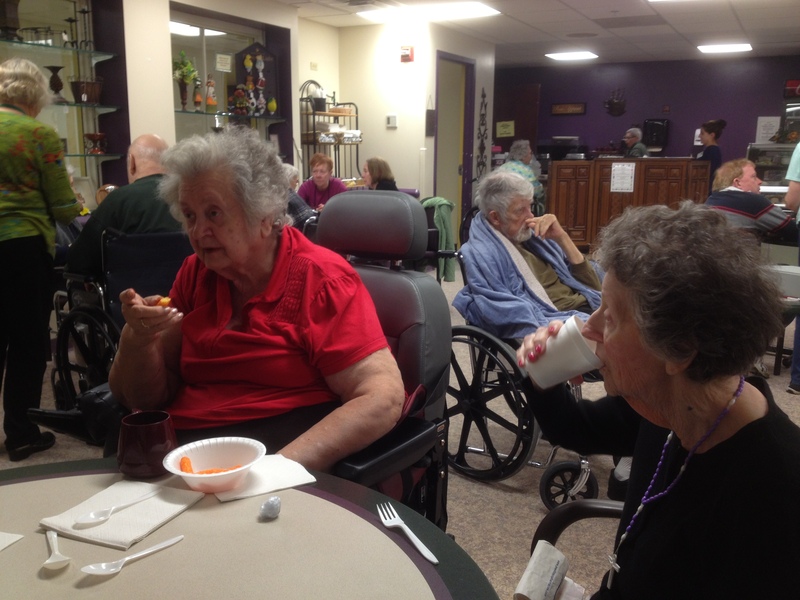 Usually, the new home is an assisted living facility or nursing center. One of the first things a guardian does is to pre-arrange the person’s funeral. The cost of cremation, burial, etc. 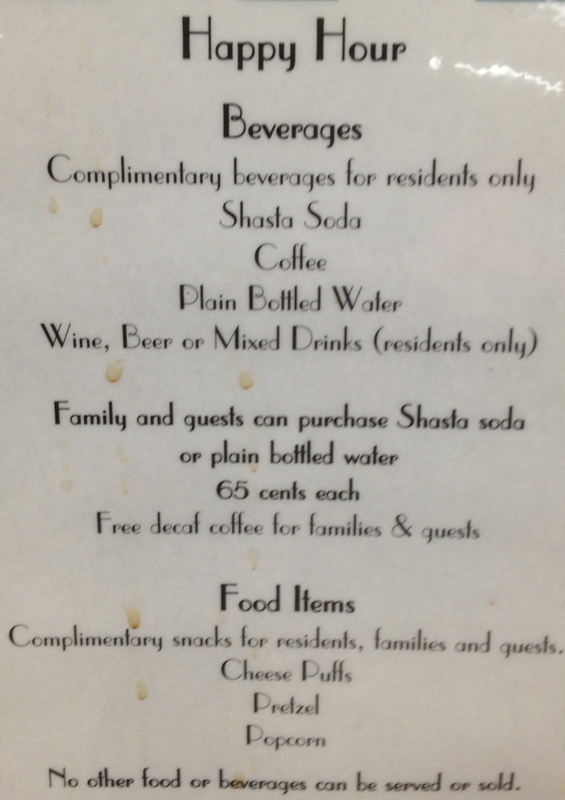 are pre-paid from the estate if there is one. The law defines what happens when there is no money in the person’s estate for funeral expenses. It is sad to know someone who is under guardianship. Right now, I happen to know someone who is in pretty good physical condition but who has challenged cognitive ability. The person often forgets things, becomes easily confused, and therefore will not know where they are or how they got there. Yet, the person is totally capable of walking out of the place. Yesterday, Peggy and I visited this person at the nursing home. I wondered how old I have to get before someone else has to take care of me. The person we visited is only seven years older than I am. Time has become my most precious commodity. Whatever time I have left is too short to carry out what I have in front of me. Time will ultimately lose to health. A loss of health cancels time and that which was once your most precious commodity takes a back seat to living with disease. Those things that drive me will become insignificant and meaningless. We found our friend in a state of depression. The realization that a guardian has total control over life had set in. The realization that there are strict rules to follow have taken away human dignity. The idea of not being able to wander around at will is atrocious, kind of like being a young child again with a very strict parent controlling your every move. When I think of ‘happy hour” I envision a group of people in a strange place meeting new friends, drinking, and noshing to while away time from home. 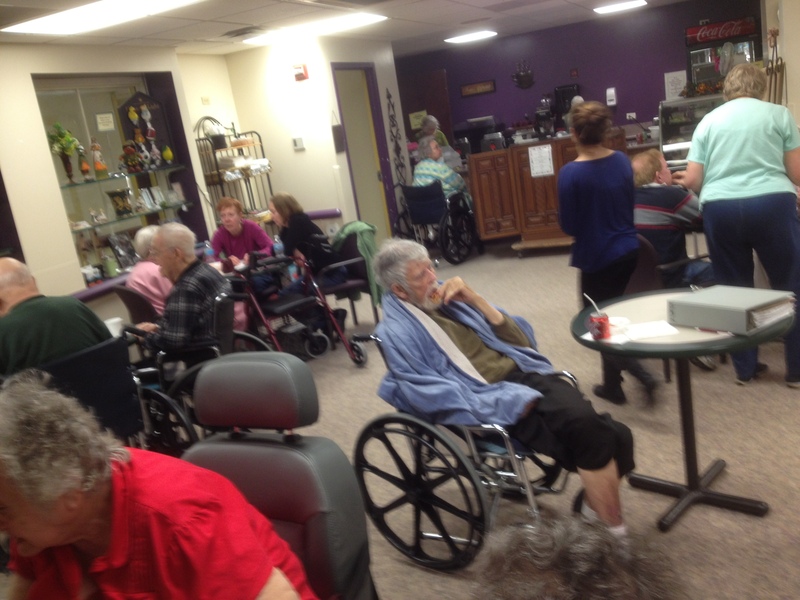 Happy hour at the nursing home begins with a rush of wheelchairs pushed into the coffee shop. 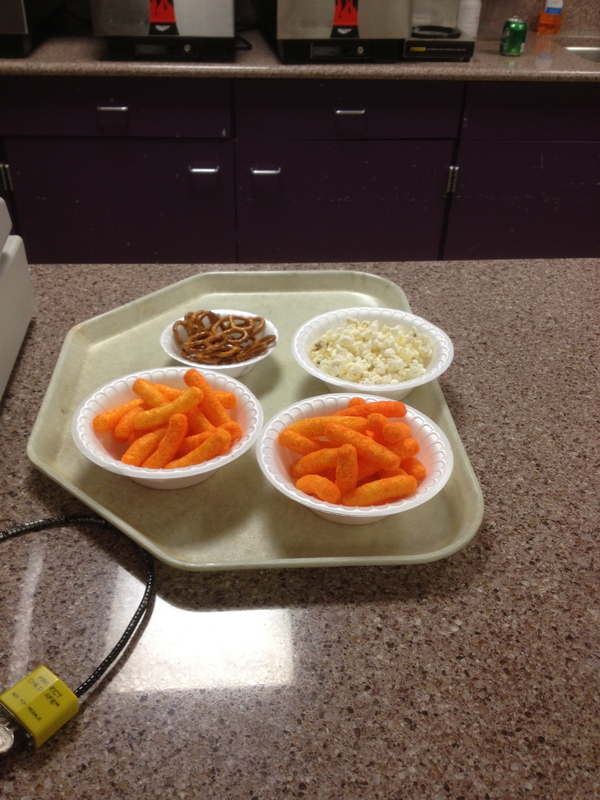 A staff member distributes plastic soup dishes filled with Cheetos or popcorn to the residents. A staffer wheels a portable bar into place. It has wine and spirits for a price. A juke box plays songs from fifty years ago. The room crowds with residents, family, and staffers chattering about the fun they have at happy hour. Elaine, an eighty-eight year old joins us with her daughter Katie. Katie related that when she visits her mom, everything is fun and fine, life is good. When Katie leaves, her mom calls Katie’s sister to come and take her out of the “hell hole.” We laugh. The truth is not funny though. It is evidence that the residents of this beautiful facility with friendly staff, and activities galore are not enough to make up for the loss of dignity felt by the residents who must live out their lives there. 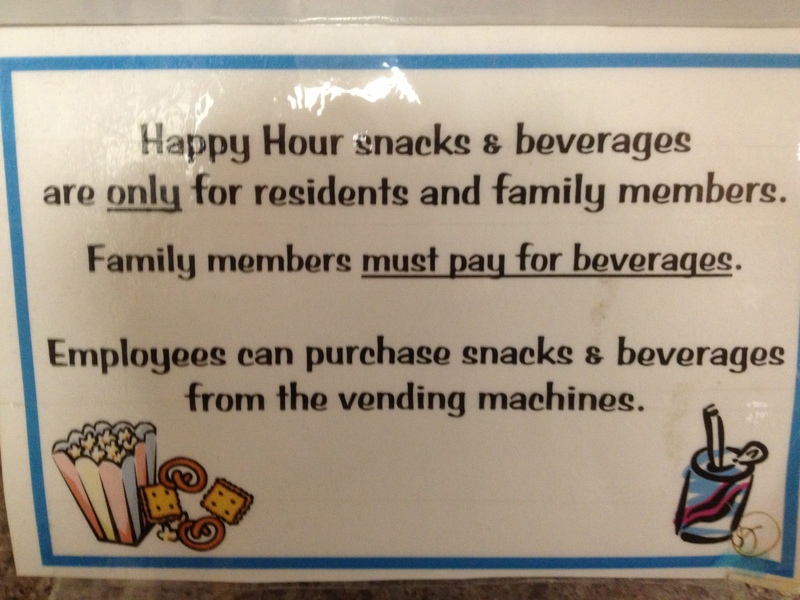 Dear God, please take me suddenly while I am visiting an older person during happy hour at the nursing home.